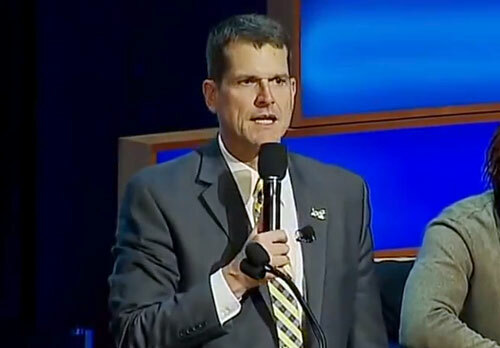 ANN ARBOR MI — University of Michigan Coach Jim Harbaugh, along with Sarah Harbaugh and Tammi Carr spoke to the crowd at Michigan’s ‘Signing of the Stars’ earlier this month in Ann Arbor. Harbaugh spent more than an hour and a half at last Friday signing autographs for fans at the M Den on Campus in Ann Arbor. He then sent all the proceeds directly to a cause that’s close to his heart. Per Tammi Carr’s Facebook page, the $10,000 paid to Harbaugh for his autograph appearance last week was directly donated to The ChadTough Foundation after the event ended. (Melanie Maxwell | MLive.com). Watch Michigan coach Jim Harbaugh talks to the fans and shares some closing words at the “Signing of the Stars” event. Coach Harbaugh is pretty amazing! He did an autograph signing at MDen last week and today I picked up a check for $10,000 from the the MDen. Coach Harbaugh asked that they donate directly to The ChadTough Foundation. People can complain about this or that….practicing in Florida or spending the night at a recruit’s house. I don’t care about any of that stuff what I care about is the man has a great heart and that he really gets it! He is giving time, money and creating awareness for a disease that has had a very small voice. He is using his power to make a difference….as are Coach Beilein, Coach Hutchins and many others. They are all great coaches and a great people and we are so thrilled to have their support! Michigan’s “Signing of the Stars” recruiting event raised more than $50,000 for The ChadTough Foundation earlier this month, while Michigan basketball coach John Beilein continues his effort to raise $100,000 for the foundation through ESPN’s “Infiniti Coaches Charity Challenge.”The ChadTough Foundation — named after the late Chad Carr — continues to fund research and raise awareness for Pediatric Brain Tumors with an emphasis on Diffuse Intrinsic Pontine Glioma (DIPG). im Harbaugh is the former head coach of the San Francisco 49ers. He led the 49ers to Super Bowl XLVII where they lost against his brother John Harbaugh and the Ravens. He is currently the head football coach at the University of Michigan.